So, as I mentioned last week, we hosted our vegetarian potluck group on Friday night. With the apartment looking the best it ever has, I set out to make our contribution to the meal. I discovered that potluck style meals are awesome to host, because instead of going crazy trying to make (and clean up after) multiple dishes/courses, there’s just the one dish you’re responsible for making. 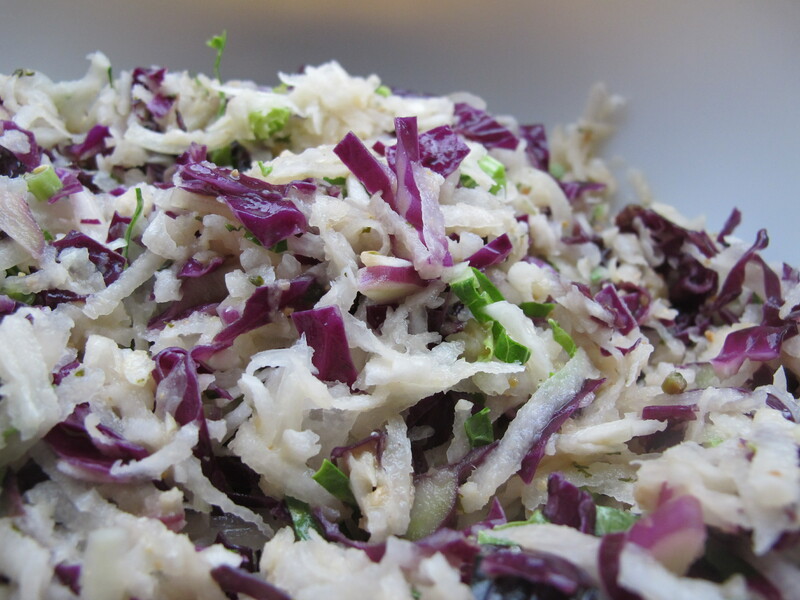 A couple of weeks ago, I made some kohlrabi-turnip slaw based on this recipe. So, while I wasn’t strictly working from a recipe when I made my dish for the potluck, this was floating around in my head. We also planned to make a second, simple dish of sliced garden tomatoes with olive oil and balsamic, but the cooler weather we’ve had (yay!) means slow-ripening tomatoes. Good thing we didn’t put all our eggs in that basket! Once I finished the slaw, I completed some final kitchen clean-up, then set out cloth napkins and real (i.e., non-disposable) plates, cups, and utensils (very thankful for the dishwasher post-party). Fifteen of our friends joined us, bringing their own lovely, local-food themed offerings, for a fun evening of dining and chatting. I received several requests for the slaw recipe, so, without further ado, my garden veggie slaw. Combine all dressing ingredients to make a rich, thick dressing. Prep your veggies. I cut the cabbage by hand and used a box grated for the kohlrabi and turnips. In a large bowl, toss shredded vegetables with the dressing. Let sit for at least two hours for flavors to meld. Serve topped with toasted sunflower seeds. *I didn’t have fresh cilantro, so I used some cilantro “pesto” that I made and froze earlier in the summer. It was a minor flavor note, so could be omitted. **You can mix and match the veggies here, depending on what you have available. Green cabbage would certainly work, while the purple adds a nice color pop. Shredded carrots would also work nicely.